Making your entry door arresting is one of the universal ways to make your home stand out. You can achieve this by picking a hue that stands in contrast with the rest of the house. For instance, a crimson or aqua front door adds a punch of color to a predominantly neutral exterior. Refraining from using a bold trim shade creates a restrained palette. As a result, your door would attract the eye and offer a grand entrance. Instead of blending in the environment, choosing a standout main color could catch some attention for your home. If you’re surrounded by lush trees, seafoam green makes an excellent siding hue. A color several notches lighter than your landscapes creates the visual separation without being too jarring. If you take this approach for your exterior painting in Alpharetta, GA, white is a great trim and accent color. Selecting just one hue doesn’t necessarily create a boring home exterior. The trick is to vary the shades of one color to create visual harmony, while rendering minor details distinguishable. Painting your entry doors with a deeper hue can make them stand out and reconcile with the rest of the exterior at the same time. The combination of black and white is a timeless trend for great reasons. It works well with any architectural style, and you can guarantee its appeal. The usual approach in painting in Marietta, GA, is choosing white over black as the main color. However, many homeowners love the trendy charm of a mostly dark exterior. After all, black is excellent in hiding imperfections, so it makes a great cover-up for concealing problem areas. 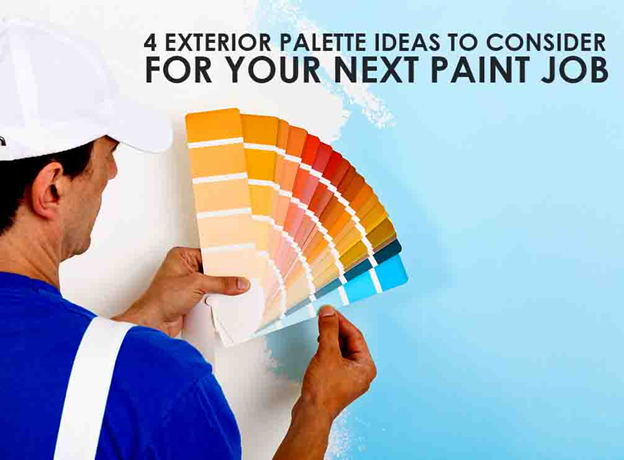 Let Nelson Exteriors help you decide on the best exterior palette for your home. Call us now at (678) 283-8171 and tell us your ideas.